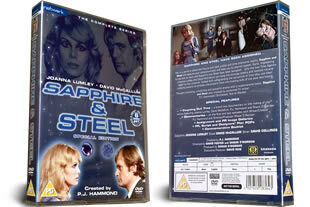 Sapphire and Steel DVD box set. The complete series on 6 dvd's. DELIVERED FREE IN THE UK. First show on tv in 1979, Sapphire and Steel stars Joanna Lumley and David McCallum as two futuristic detectives who solve mysteries with some unusual methods. The show is a sci-fi must. 6 DVD Box Set delivered to your door.